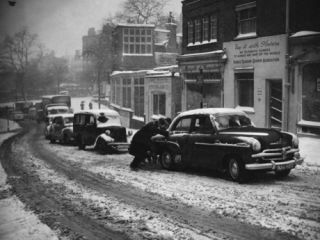 A big freeze hits Britain with roads and rail services severely disrupted by snow leaving the worst affected areas relying on the RAF for food and medical supplies, yet Summer brings a heatwave and drought! The HMS Ark Royal Aircraft carrier completed; Christopher Cockerell patents the hovercraft; Cardiff is officially the capital of Wales; unemployment stands at just over 215,000 which represents just 1% of the British workforce; and Birdseye fish fingers are now on sale in Great Britain. Stirling Moss is the first Englishman to win the British Grand Prix; the Guinness Book of Records is published for the first time; the Supermarine Spitfire is the debut model kit by Airfix; the Queen opens a new terminal at London Airport; and Princess Margaret and Group Captain Peter Townsend cancel their proposed marriage. Gibson introduces The Byrdland, a hollowbody jazz style archtop with a single Venetian (rounded) cutaway and two single-coil Alnico pickups. It's designed in conjunction with Nashville session men Billy Byrd and Hank Garland and named accordingly. Sporting a fully bound tortoiseshell scratchplate, flamed maple back, sides and neck the Byrdland produces a warm yet robust sound. New films include The Dam Busters and The Ladykillers; the Hammer Film production of The Quatermass Xperiment is released, based on the BBC Television serial written by Nigel Kneale. Gibbs SR toothpaste is the first advert to be shown on the new commercial television station, Kenneth Kendall and Richard Baker are the first newsreaders to be seen on BBC television and The Return Of The King, the third and final part of JRR Tolkien's The Lord Of The Rings, is published. Framus officially opens its new works in Bubenreuth. The company is now producing its acoustic archtop guitars with added pickups like the Sorella, a single cutaway body that's now available with or without a Schaller pickguard/pickup assembly. Framus is also producing the Hi-Fi, a 65-watt amplifier with a 12-inch speaker and a pair of side-mounted tweeters. This powerful combo features two EL34 power valves and a 12AX7 in the preamp and proves ideal for electric guitars. The White Falcon flies in as one of the most striking Gretsch guitars to date. It was displayed on the Gretsch stand at last year's NAMM show as 'the guitar of the future' and although never meant for production, interest in the guitar has been so great that it just had to be done. Also known as the 6136, the White Falcon features a rounded cutaway on a slim hollow body, a pair of DynaSonic single-coils, 'G' trapeze tailpiece and a Melitabridge. "It's the finest guitar we know how to make" declares Gretsch!